Prayer niche in the interior of the Chota Sona Masjid or Small Golden Mosque, Gaur. bl.uk > Online Gallery Home	> Online exhibitions	> Asia, Pacific and Africa Collections	> Prayer niche in the interior of the Chota Sona Masjid or Small Golden Mosque, Gaur. 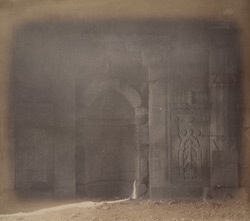 This is one of a series of photographs taken by Joseph Beglar for the Archaeological Survey of India in the former sultanate capital of Gaur in what today straddles the border betwee Bangladesh and West Bengal in India. The Chota Sona Mosque, or Lesser Golden Mosque, was built c.1493-1519 during the reign of Sultan Alauddin Husain Shah. This view shows the mihrab, or recessed prayer niche surrounded by black basalt stone panels decorated with inscriptions, rosettes and vegetal motifs in carved relief. The mihrab is a directional marker indicating the position of Mecca towards where Muslims focus their prostrations during prayer times.